Forget John and Kate. Forget Brad and Angelina. There is a new celebrity couple Thursday morning. The celebrity polar bear circuit has a new star; Giovanna. She's been strutting her stuff on a temporary visit to the Berlin Zoo, where they know a thing or two about marketing bears. Followers of the polar bear celebrity magazines will know that Berlin is where an orphaned little bear named Knut joined the ranks of Smokey and Yogi as bears known 'round the world. That was three years ago and the decision to keep Knut alive was considered a controversial one both in the worlds of zoology and bear show-biz. 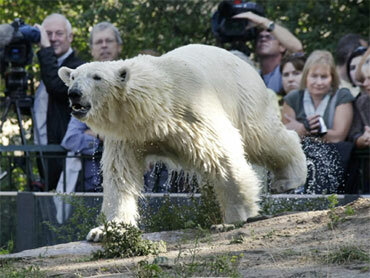 But Knut was boffo at the box office; Berlin Zoo attendance doubled. Now, Knut is no longer a cuddly little thing. He's all bear. And it's time he started dating. Enter Giovanna. She was born at the same time as Knut and is currently paying a visit to Berlin while her home in Munich is refurbished. Could this be a marriage made in heaven - or at least in the minds of the imaginative publicists of at the Berlin Zoo? One potential hurdle; this match-matching is a little early. Polar bears don't reach sexual maturity until somewhere between 3-and-a-half and 5-years-old. Knut and Giovanna, we're told, have had a little back stage sniff already and the good news is they don't seem to hate each other.